"Super Word" Vocabulary Trading Card Template - a FUN way to teach vocab! Have your students create a getting to know you assignment. They create a trading card about themselves. I used this in FSL for a Je me presente project. 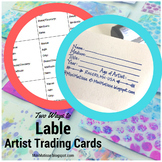 They can also be used to create trading cards for fictional characters or historical personas. 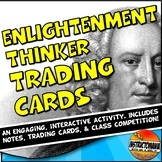 You can use this template to make trading cards for learning about people. I used it for Black History Month. Students choose an African American person that made a difference in history and write their name, draw their picture, write a few memorable things about them, and color their card. Students can practice distinguishing between the homophones their/there/they're by creating 'trading cards' highlighting the word, sentence, and picture. 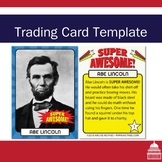 Use this simple template to have your students make trading cards for important concepts or people. They can trade them in class and learn new ideas! This template supports the Artist Trading Card Swap on MiniMatisse.blogspot.com blog. 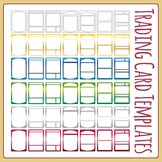 These cards can be trimmed down to 2 1/2 by 3 1/2 inch cards for trading.